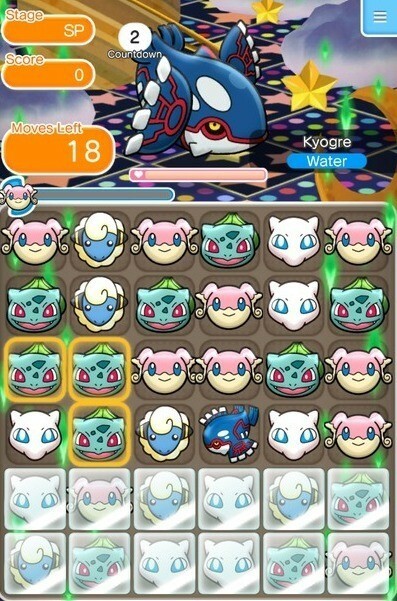 On the mobile platform, match-3 puzzle games are dime a dozen, but Pokemon Shuffle’s unique gameplay makes it stand out of the crowd. The Pokemon Company is known for unique games. However, there’s a dearth of Pokemon Games on Android. Thankfully, developers have listened to the plight of fans and released a fun RPG game called Pokemon Quest. Because you can drag a creature from any corner of the game board and move it to the desired spot, you will have plenty of match options. Matching 4 or 5 creatures of the same type can decrease your opponent’s HP faster. Also, try matching creatures in an L shape or a cross shape to trigger combos. In move-based levels, where you will have to defeat an opponent before you run out of moves, look for matches of 4 or 5 first. Try to make as many big matches as possible to reduce your opponent’s HP faster. This way, you will have more moves left in the end. All remaining moves will be used to fill the “Catchability” meter, increasing the chances of capturing a Pokemon. Try making larger matches involving a creature whose type is stronger than the opponent’s type. Make sure you have it in your support team. This is another way to decrease his HP faster. You also get an attack advantage if the stronger creature in your team unleashes attack power after matching 4 or 5 creatures of the same type. 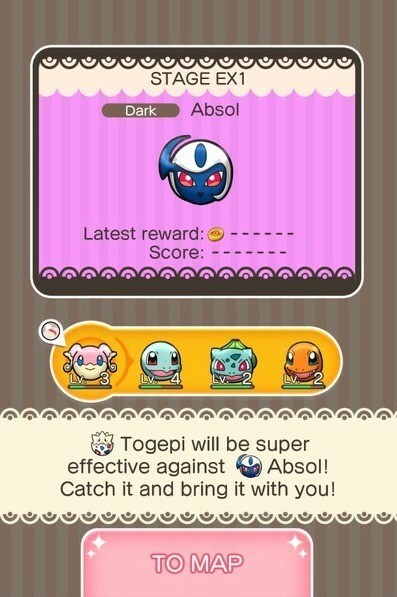 Keep a tab on a creature’s special attacks by tapping on the Pokeball beside the “Continue” button. Keep an eye on your opponent’s “Countdown” number. Once it hits zero, it will unleash an attack, turning creatures on the game board into ice or wooden blocks. In move-based levels, try to make at least 4 matches before the countdown hits 0. You may also try to match a creature selected for a mega evolution (needs a mega stone). Focus only on that creature and make quick matches so that the gauge is filled more than 50 percent. Defeating a legendary or rare creature in “Special Events” and “Expert” levels won’t be easy. If you fail to defeat it, the game will give a useful hint. It will suggest a Pokemon that you couldn’t capture while playing normal levels. Go back to that level and play it again to capture the required creature. Add the creature to your team, replay the special level and maybe you will defeat the tougher opponent next time. But hurry up capturing the required Pokemon as special stages won’t be available for long. Expert levels in Pokemon Shuffle are timer-based. You will be able to match as many creatures as possible before the timer runs out. Since there are no move limits, you can easily match 3 or more creatures at the same time. While matching creatures, keep an eye on other areas of the game board for possible matches and if you find one, quickly drag a matching Pokemon towards it. This way, you can get two matches at the same time and save precious seconds. Matching creatures at the same time not only saves time, but also clears the board faster, clearing the path for more creatures. It also increases the chances of getting combo matches. The more quick matches you make simultaneously, the more combos you will earn. 4. Choosing Pokemon Support: Optimize or Manual Selection? You can take 4 captured Pokemon along with you to battle. However, make sure you choose the best among the rest. If you have captured more than 4 creatures, then use the “Optimize” option to have the best Pokemon line up for battle. 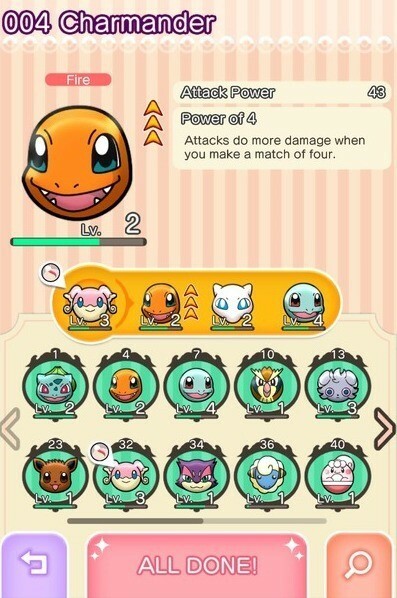 In case you want to know more about each creature’s special skills, tap the Poke Ball icon just beside the “Continue” button and then select a creature to know more about its “Attack Power”. You may manually choose your support Pokemon, but using Optimize would be a wiser option as the AI selects better creatures, including those whose types are stronger then the opponent’s type. However, manually selecting creatures also has its own benefits: You can choose high level creatures, something which the AI fails to do so. AI does choose a strong creature, but sometimes fails to select a high level Pokemon. Optimize will surely add at least one of two Pokemon whose type is stronger than the opponent (in case you have such creatures). The rest will be random creatures selected by the AI, you can replace the random creature with someone of your choice, maybe a higher-level Pokemon or someone who is about to advance to the next level and needs only a few matches to level-up. 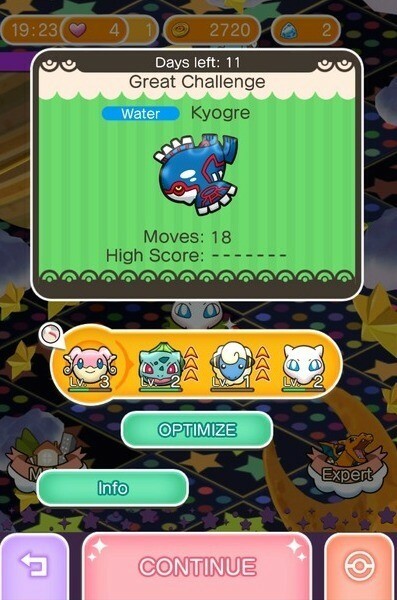 If you have a creature that has the level bar filled more than 50 percent and your matches involve creatures of the same type, then that Pokemon will level-up faster. If there aren’t any creature type(s) stronger than the opponent’s, then select those creatures that unleash their “Attack power” when you match 4 or 5 creatures belonging to the same Pokemon. Choosing such creatures will ensure that the opponent loses HP faster. If you don’t like the current set-up, you can tap the Optimize button again to replace the current creatures with other creatures. You may have to tap a few more times to get the desired team. If you still don’t like the set-up, prefer manual selection. In a nutshell, have a mix of creatures chosen by the AI and you. Prefer higher-level creatures or those who are on the verge of gaining a new level over others, and have a type stronger than the opponent, (usually chosen by the AI). These items are quite cheaper than the rest. “Moves +5” costs 1000 coins and “Disruption Delay” costs 2000 coins. Yes, there are a few items cheaper than them, but they are probably the most useful items that you should use them before playing a harder level. Make sure you have earned enough coins. Save coins for harder levels and spend them on DD and extra moves. Use them in Special levels, especially those that let you fight a legendary creature. In Expert levels, use “Time +10” and “Exp Points x 1.5”. This will help you make more matches and reduce opponent’s HP quickly. Extra time will give additional seconds and EXP points will increase your current support team experience points by 50 percent at the end of a level. Each creature has its own strengths and weaknesses. You should take stronger types with you to battle or use Optimize to have the best type set-up against an opponent. This list provides creature elements and their relationship with other types, giving you a clear idea of their strengths and weaknesses. And never, ever say Yes when the game asks you if you want to recover 5 moves for a jewel. They’re ripping you off; +5 moves is only 1000 coins.